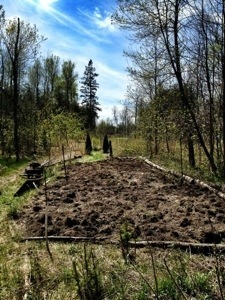 Last spring we embarked on ambitious mission to grow a ton of food in our backyard. We wanted to produce clean, pesticide-free, organic, healthy food and also get the kids involved so they learn about where our food comes from and the difference between whole food and processed “food” that comes from stores. My parents had backyard gardens in UK and later Canada when I was younger, so home grown food was not new to me, and we have been growing sprouts in our kitchen for a few years now and tomatoes on our deck, but we had never considered a full blown veggie patch outside. In spite of a lack of experience, we figured that growing our own veggies would require several things to work: land, soil, organization, irrigation, critter control, farming and of course the plants themselves. I will go through how we tackled each one in roughly chronological order. We live about 45 minutes south west of Ottawa and just over 3 acres of land so space is not really an issue, however much of our property is overgrown with thick brush year round. 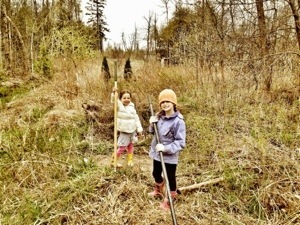 In early April when all the snow had melted, the kids and I staked out a patch of 20′ x 40′ land in the back corner of our property, squeezed in between a line of trees and an easement. 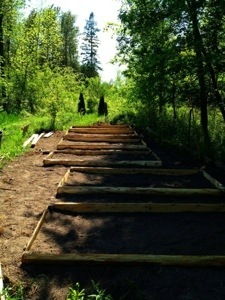 The spot we choose faced south and was clear of trees on three sides so it received sunshine from morning to evening. As you can see from the pic below it was covered in brambly type brush, logs and dead trees which hadn’t been cleared since our neighborhood was built about 20 years ago, so we had a great deal to cleanup. It took a fair bit of time and effort, but working over the next few weekends we eventually hacked everything down, burned it all in a big bonfire and then turned the ground over and over, eventually leaving us with a course base of dirt to work wit that was pretty much free of old roots. Having seen some good looking plant boxes, we decided we would build six 4′ x 10′ planters using raw cedar planks that my brother-in-law kindly gave us. 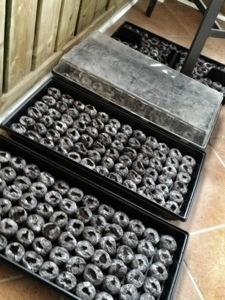 Plant boxes would contain our plants, make it easier to weed and allow us to move freely between the boxes. The planks formed a 12″ deep box and I fastened them together with 2″ x 2″ wood blocks in each corner that were about 18″ long so they dug into the ground below the box edge and help secure the box along with the dirt when filled. 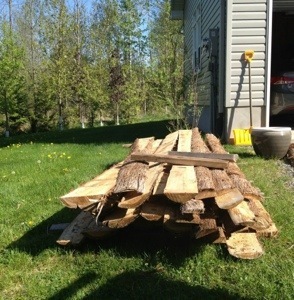 I’m no carpenter, but once the boxes were put together, they looked alright and were certainly functional. While this is our first garden, common sense told me that we would need blacker soil than the sandyish soil that we had in our plot. I figured if the soil was too sandy, it wouldn’t hold water and dry out too fast in the summer heat. We could have augmented the soil in our garden with the good black soil we had elsewhere on our lot, but that was located amongst the trees and virtually impossible to extract, so I had to order soil and in so doing learned my first two important lessons about soil. Firstly I learned about amounts. On a Friday morning I called a couple of places to get a quotes for topsoil. The second place offered a much better price and could deliver that evening which meant we could work on the garden over the weekend. Without thinking too much about quantity I ordered a yard, which doesn’t sound like much until the dump truck showed up and left a mountain of dirt on my front lawn. I only needed about 30 wheelbarrows of soil, but in the end I must have moved more than 200 loads from the front of our house. The company offered me a yard because I asked for topsoil, which leads to my second important lesson about soil. Topsoil and garden soil are two different things. Topsoil is usually used to prepare a lawn for seed or under sod and is usually soil mixed with sand (in fact, mixing in sand is a common trick vendors use to be able to sell more “soil” at a cheaper price). Garden soil, on the other hand, has plenty of organic matter and is exactly what I should have ordered if I was paying attention. In any event, we used what we had and filled our boxes. I also worked in several bales of peat moss and some bags of potting soil with a small tiller I borrowed from my father-in-law. With a bit of work the soil looked decent and was good and loose. In our neighborhood there are cats, raccoons, rabbits, chipmunks, squirrels, other rodents, lots of birds and snakes, all of which would pose various threats to the livelihood of our crop unless we had some sort of system to keep them out. I looked on youtube and saw various contraptions and fenced in gardens. I also talked to some experienced gardeners that suggested simply using bone meal around the plants, but I decided to fence the whole area with chicken wire about three feet high. 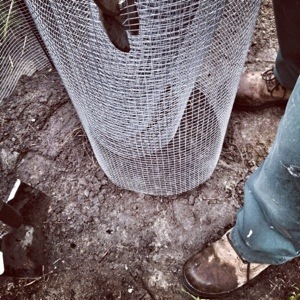 We sunk the chicken wire under the ground level about 6″-8″ to prevent critters from digging under the fence. 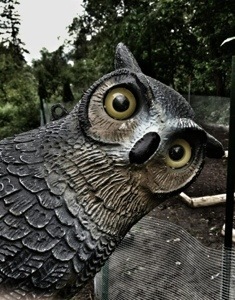 I assumed some animals would be able to climb over the top, so to discourage this we perched a plastic owl on a post. It gets hot in the summer here, so we knew irrigation would be critical. I ran a hose from the house to the garden (about 100′ away) and set up a circular lawn sprinkler, but couldn’t get it to cover the whole patch, so I had to set one in both halves of the patch. There wasn’t enough pressure to run them both at the same time, so I set up a switch whereby I could water half the garden at a time. After the plants started to grow the leaves blocked the water from the sprinklers, so I had to move the sprinklers up to clear the plant tops. I duct taped the sprinklers to old hockey sticks I jammed in the ground, which raised the sprinkler heads about 4 feet which was perfect again for covering the whole patch. The summer was super hot and we ended up watering pretty much every day, usually in the early evening. I painstakingly mapped out what was in the seed trays because it is easy to lose track and hard to recognize the tiny plants while they were still small. 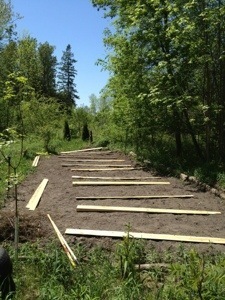 This was a critical step as I had mapped out how I would like to have the plants arranged in the garden. 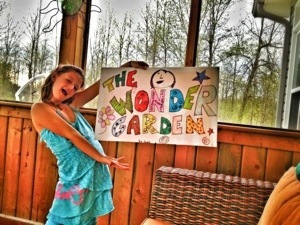 Around this time, our eldest daughter decided to give our garden a name, the Wonder Garden, which was great because the more they kids got involved, the more they learned. We put our seed trays in the window at first and then on our screen porch covering them with the clear plastic lids to keep them warm. The seedlings sprouted quickly and by the end of May it was consistently warm enough outside to transfer our seedlings to the ground. I was worried about the quality of our soil for growing, but that was put to rest when everything shot up quickly (including the weeds around our boxes). The leaf plants and herbs were the first to mature enough to harvest. 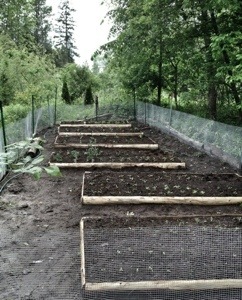 Chard, kale, lettuce, basil, parsley and more. All delicious. Although the kids were not as enthusiastic about eating green foods as my wife and I were, they were pretty amazed that you can just go out back and get food. My eldest daughter liked to join me and help me choose stuff to bring in. And bring in we did – by the bushel. At first getting to all the plants was easy and the boxes made it simple to pull weeds both inside the growing areas and in between, but my mid summer I realized I had made a mistake by putting the marrows in the middle of the patch and next to the tomatoes. Both the marrows and tomatoes went wild and spread amongst each other, outside their respective boxes and in the case of the squash, ran vines to all corners of the garden. If I was to do it again, I’d put the these two groups of plants at the edges of the garden and clip the squash plants to keep them contained. I will also set up trellis for the squash since it can grow upwards and still produce marrows. Lettuce was the first to harvest and also the first to pass its due date. 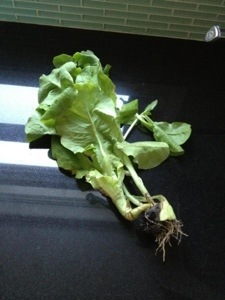 While plants like chard, kale and parsley, are low maintenance because you just harvest leaves, the lettuce bolts (goes to seed) quickly and takes on a bitter taste at which point, it is time to plant a second crop. Basil tries to go to seed as well, but it doesn’t change taste and will continue producing leaves if you nip the flowers as they grow. 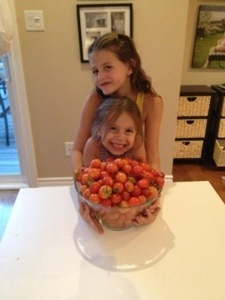 By late summer tomatoes were coming in and we ended up bringing in buckets of tiny tomatoes at a time. In the fall the squash and pumpkins harvested and we are still eating those. Deelish. 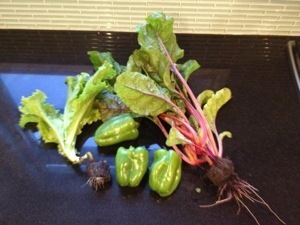 Surprisingly the lettuce, chard and kale were still growing late in the fall even after a couple of frost. Very hardy. In the past we had composted off and on, but now we had a real purpose and had immense amounts of chemical free bio waste that would be very useful in improving our soil quality so I set up a composting area with several big bins. 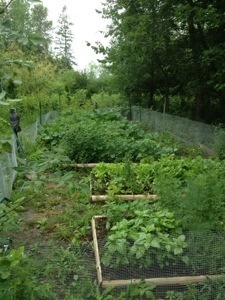 We kept a collector in our kitchen and every couple of days I would take it out back to the composting area. Periodically I would mix in soil and turn the compost and before soon we had a mountain of good quality black organic matter that we can turn into the soil next spring. Most of what we planted worked really well. 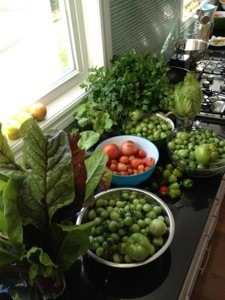 Particularly good were the herbs, lettuce, chard, kale and the tomatoes. 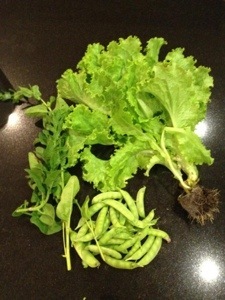 Salads are out of the world when they use greens that were picked from garden minutes before dinner. The green peppers were so sweet and watery I ate them like apples and the squash, pumpkin and zucchini all contributed to countless yummy meals. We felt pretty blessed while the crops were pouring into the house. Irrigating with the two sprinklers was a little inconvenient, because I had to remember to run out and switch the tap from one side to the other, but worked well to keep the plants well watered. Our critter control system worked flawlessly and with the exception of one garter snake that got in early and then grew too large to escape through the holes in the chicken wire, there was no evidence of any animals in the garden. There were a few plants that didn’t seem to work well for us. For instance, our spinach bolted quickly and didn’t yield much food, our carrots got lost under the creeping squash and our cucumbers, cabbage and cauliflowers all stunted. I wondered if it was our soil, but a couple of farmers at the local Farmer’s Market told me that this summer’s unusually high temperatures prevented a lot of crops from maturing properly. Our peas yielded only some peas but I didn’t set up the trellis properly and the plants soon after stopped producing peas. 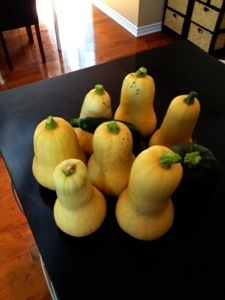 I hadn’t expected my zucchinis to produce so quickly and didn’t there were some that had grown quite large by the time I had found them. At this point they were tougher than the zucchini’s you would find in a store, but still good for stews so we used them in any event. In the end we had tons of great fresh food and it was great to get the kids involved in learning about food. In early October we brought in the last of the food, including tons of green tomatoes and we made some salsa’s and sauces from the red tomatoes as you can see in the pictures below. 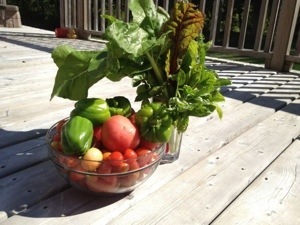 Now that the garden is closed, we really miss all the fresh produce. During the summer, homegrown food made up about 60% of what we are eating and although I sprout various greens in the kitchen year round, sprouts don’t have the volume to replace the home grown veggies. We are contemplating trying to grow food indoors this winter with lamps, but I haven’t yet tackled that project so it may not happen until next winter. In the meantime, we are thinking about what we will grow next year. Growing some of the plants upwards will create new space so we can look at adding some new foods like onions and garlic and maybe sweet potatoes. Plus composting the soil should make things even tastier, if that’s even possible. 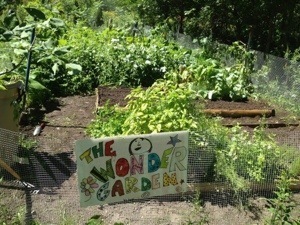 The Wonder Garden was a fun project, great learning for the kids, healthy and best of all, super tasty. I can’t wait to do it all again next spring.